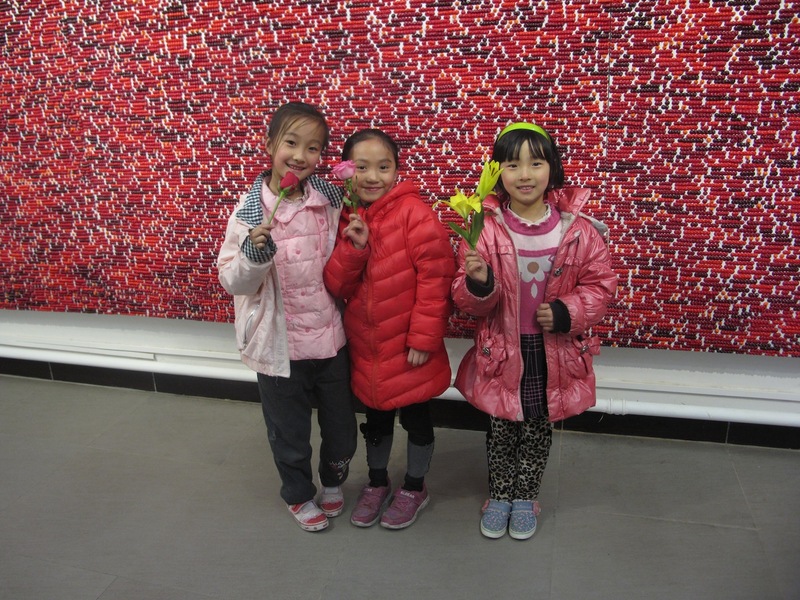 Telescope opened April 6 with its second exhibition, Irrational . 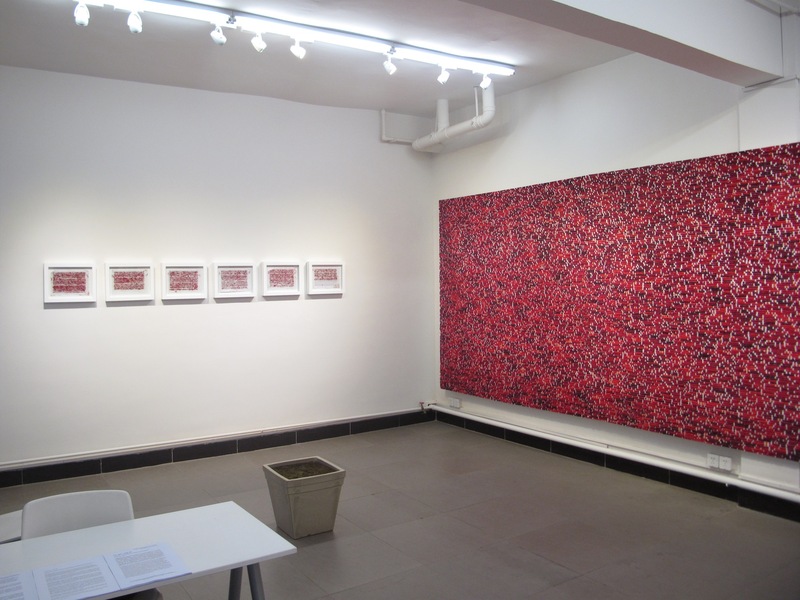 Transcendent; an exhibition of paintings and drawings by Beijing artist Li Zhenwei. This is Li’s first solo show and features his newest large scale 600cm x 200cm painting, None, #20. 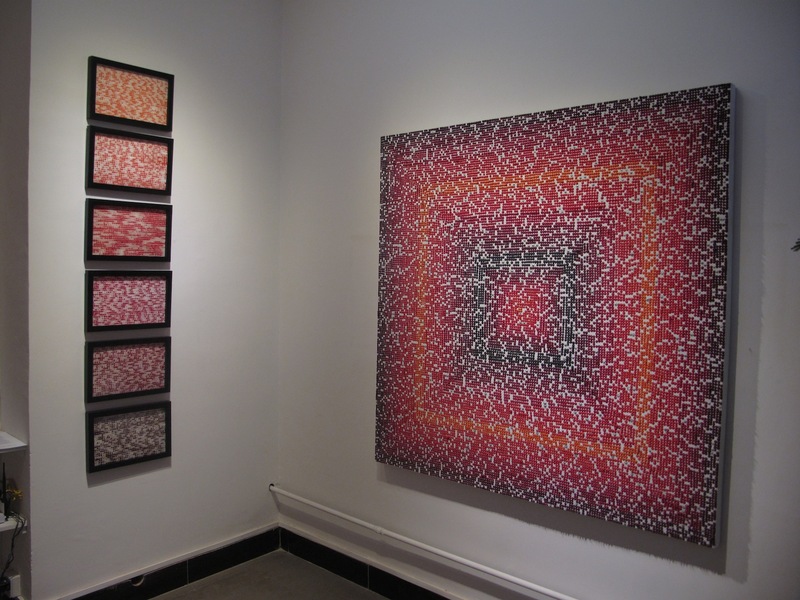 Li Zhenwei uses various mathematical systems to create his work. The paintings in his exhibition at Telescope, Irrational · Transcendent, are based on Pi, a mathematical constant that is the ratio of a circle’s circumference to it’s diameter. Its decimal representation never ends and never settles into a permanent repeating pattern. In mathematical terminology, it is an “irrational” and a “transcendental” number, it never repeats and never ends. Li uses Pi to determine the numbering, spacing, color, and densities of the points of paint he applies to the canvas. Although mathematics is involved in his process, it is just another material in the artist’s hand. Li’s deeper relationship to Pi is in the psychological, emotional, and spiritual understanding of the irrational and the transcendent. Together Pi and paint are a foundation for his creative process and a path for him to go beyond his limitations and find new ways of expressing his innermost being. 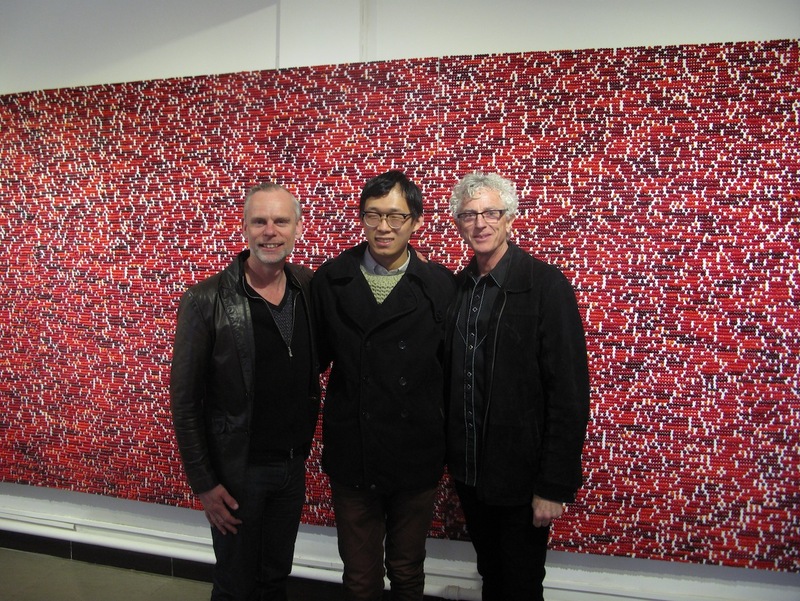 Irrational · Transcendent is Li’s first solo exhibition and features his newest large scale painting, None, #20, a 600cm x 200cm painting of thick undulating hues of red dots and blank spaces. It is a dynamic and hypnotic work, which is rather like watching a swarm of static on a massive television screen. The patterns of dots, extruded by hand from tubes of oil paint into long rows, never repeat in pattern and seemingly never end. The painting could go on forever if there was enough canvas, oil paint, and time and space in the world. Li Zhenwei, born in northeast China in 1987, was trained from the age of five years old in traditional Chinese, as well as classical western, drawing and painting. Born in the computer age in a country coming of age, Li was also introduced to digital technology and access to the outside world through the World Wide Web. Over the years of study and life these two worlds collided in his art practice. Not content to rest on his traditional skills he searched within for a deeper means of expression that could make sense of the old and the new, a voice that would actually speak more clearly to his questions of life, culture, and art in a rapidly changing contemporary world. He had already begun to move in this direction but during his years at CAFA (Central Academy of Art, Beijing) he reduced his learned and observed information to the simplest of gestures, the dot (a point, pixel, or molecule). “Everything is made of dots, every line, shape, and mass...the dot holds all the possibilities and complexities of life and art,” says Li. His paintings are made with this simple gesture, points of paint of varying densities, extruded from a paint tube onto naked canvas, no brushwork needed anymore. One might say that his work is “abstract” and technically it is, but actually it is not abstract at all, but a new personal language that speaks of his experience as a unique young man growing up in these two disparate worlds. A quote from Aristotle is specifically appropriate to Li’s painting technique, “The whole is greater than the sum of its parts.” Li’s paint application decisions are not random, there are always rules, sometimes Li employs a system based on Pi, a transcendental number that never repeats and never ends, to determine the quantity and thickness of points and spaces. These various systems represent to Li the convergence of ancient Chinese philosophies of viewing the universe and life itself and today’s digitized media hyped environment. The seemingly mechanical application of row after row of 100’s and 1000’s of individual squirts of red paint on canvas all together surprisingly transcend themselves and attain a romantic tactile sensuality, a field of lush hypnotic red that beckons one to enter, taste, and touch.